If you read our latest laptop buyer's guide, you may have noticed we included a lot of high-end PCs. Which makes sense: we've been quite busy reviewing flagship devices since Windows 8 went on sale last fall. We're talking the best Microsoft's partners have to offer: twisting screens, dual screens, 8-second boot-up times. That's been fun, and we're pretty sure those are the more interesting products to read about, but even so, we decided it's high time we started reviewing some more mid-range systems -- you know, those models that don't cost $1,200. So, in the coming months, you're going to see us review more of these everyman systems, in addition to those lustworthy flagships. First up: the Samsung Series 5 UltraTouch. We'll admit, we're a little tardy here, as this went on sale late last year, but if you've never heard of it, it's basically last year's Series 5 Ultrabook with a touch panel appended. For the money ($800 and up), you get some modest specs (Core i3 / i5 processors with hybrid storage and a 1,366 x 768 screen), though if our research is correct, those are the same basic specs you'll find on most competing models. Given that, any display snobs can show themselves the door now, before we even get started. But what if you've been looking for a more affordable Windows 8 system? How does Samsung's entry stack up? The Series 5 UltraTouch is a solid mid-range Windows 8 Ultrabook, with decent battery life, a responsive touchscreen and a tasteful design. If you wanted, though, you could get the same specs for less money. Be the first to review the Series 5 Ultra Touch? While writing this review, I actually had to double-check the Series 5's spec sheet to make sure it really had a 13-inch screen. There are two reasons for this: one good, one bad. Starting on a high note, the display here is, for all intents and purposes, an edge-to-edge panel, ringed by a fingernail-thin piece of buffer. So that helps make the system appear bigger than it is (in a good way). The problem is, at 3.83 pounds, it's heavy for a 13-inch Ultrabook, even compared to other touchscreen models like the Sony VAIO T13. 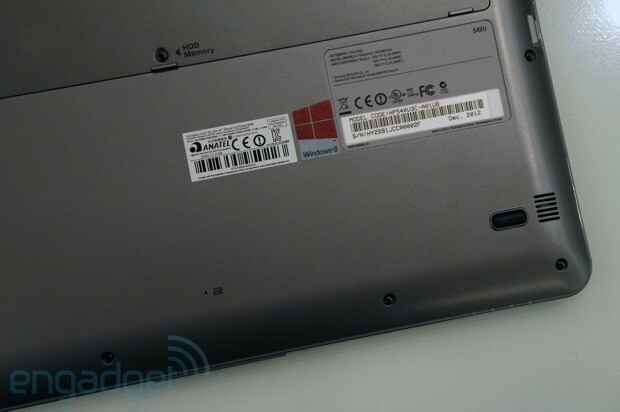 In fact, the Series 5 is even weightier than some 14-inch offerings, like the Lenovo ThinkPad X1 Carbon Touch. So it's heavy, but at least it's tastefully designed. The aluminum lid and plastic bottom are each done up in a silvery, inoffensive shade of gray. The cover and palm rest both have a fine brushed texture -- a classy touch with the added benefit of disguising fingerprint stains. Indeed, throughout our testing, the interior continued to look as pristine as it did the day we unboxed it. Other than that, Samsung went easy on the flashy touches -- there's a thin band of chrome ringing the keyboard, with the speaker grille sitting prominently above, but other than that... there's not much to it. And that's a good thing, we think. 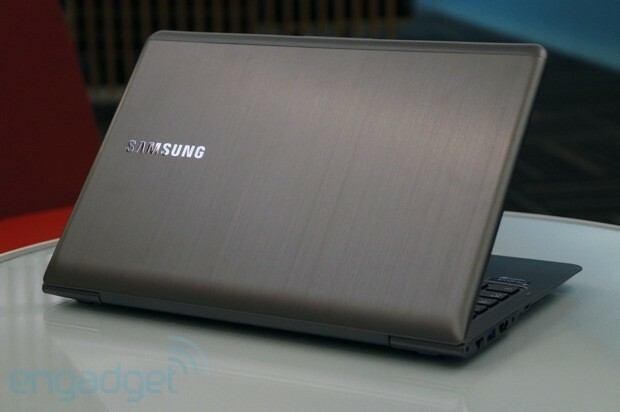 Like other Samsung laptops (the Series 9, original Series 5, etc.) 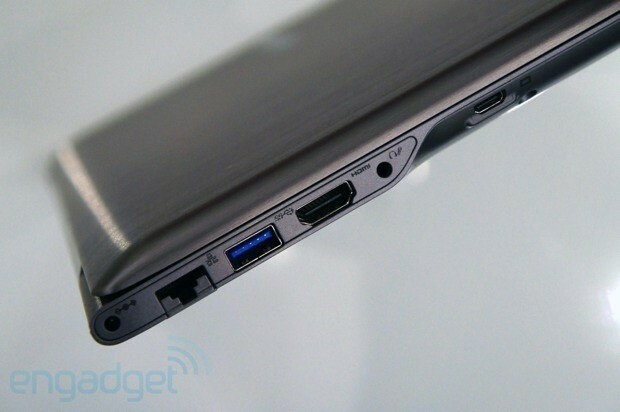 the edges widen toward the hinge to accommodate all those ports, and then taper down as you move up toward the trackpad. It gives the machine some visual flare, for one thing, making it more interesting to look at than your typical box. But it serves a practical purpose too: when you hold the notebook in two hands, those curved edges create a natural resting place for your fingers. Speaking of, the build quality here is about what you'd expect on a mid-range laptop, which is to say it's sturdy, but stops short of feeling premium. The hinge is tightly wound, so that while it's easy to adjust the screen angles, the display also isn't likely to wobble when you set the machine down. At the same time, it's fairly easy to flex and twist the chassis, especially around the palm rest. You won't notice unless you pick it up by the edges, so it shouldn't be a dealbreaker by any means. It's just a reminder this isn't a flagship machine, but you already knew that. We mentioned earlier that the Series 5 Ultra is well-stocked with ports. Well, here they are. On board, we have three USB ports (one of them 3.0), an Ethernet jack, HDMI, mini VGA (dongle sold separately), a 3-in-1 memory card slot and a headphone / mic socket. Sure, it would've been nice if all of those USB ports were 3.0 but nonetheless, this is a better selection than what you'll get on most ultraportables. We rarely say this about Ultrabooks, but in the case of the Series 5 UltraTouch, we have no complaints about the keyboard. Were you waiting for a "but"? Because we've got it right here. The Elan touchpad sadly isn't great. It works well for two-finger scrolling, as well as swiping in from the right to expose the Charms Bar. But sometimes, when we wanted to swipe down from the top to bring up menu options, or switch tabs in IE10, we had to try several times before our gesture registered. Worst of all, though, might be single-finger navigation, which seems to be the Achilles' heel on a lot of Windows trackpads. Put simply, the cursor just doesn't always go where we want it to: sometimes it goes rogue and ends up in a random spot. Sometimes it stops short before it gets to whatever it is we meant to click. Either way, it's annoying. 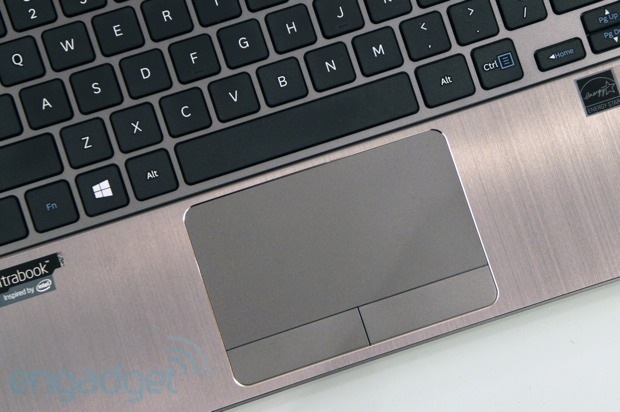 Also, the palm rejection on this particular touchpad could use some fine-tuning: more than once, the cursor jumped to random parts of our Word document as we were drafting this review. The one saving grace might be the two dedicated left- and right-touch buttons, which are easy to press, and which ensure you'll never have to deal with a left click that gets registered as a right one. For some reason, 1,366 x 768 continues to be the standard for laptops, even ones like this that are too expensive to meet anyone's definition of the word "budget." For some reason, 1,366 x 768 continues to be the standard for laptops, even ones like this that are too expensive to meet anyone's definition of the word "budget." In any case, though, it is what it is: after researching comparable models, it seems like all of them have HD screens. So while we wish this could at least have a 1,600 x 900 resolution, we won't flag that as a con. Besides, as we've said many times, resolution isn't even everything. The bigger problem here isn't the number of pixels, but the fact that this is a run-of-the-mill LED screen. Samsung didn't use its own PLS technology here, so the viewing angles are fairly narrow, especially if you're looking at the machine head-on and thinking about dipping the lid forward. Do that and the color balance starts to fall apart, and the glare makes it difficult to see anything. Visibility is a bit better from the sides (good news if you have friends over to watch movies), but even then, the reflections can be distracting. Basically, then, you'll want to turn off the lights before plowing through House of Cards. On the bright side, the 300-nit touchscreen is great as, well, a touchscreen. Tapping to launch an app? Not a problem. Swiping in from the left to change apps, or swiping in from the right to expose the Charms Bar? It handles those with aplomb too. 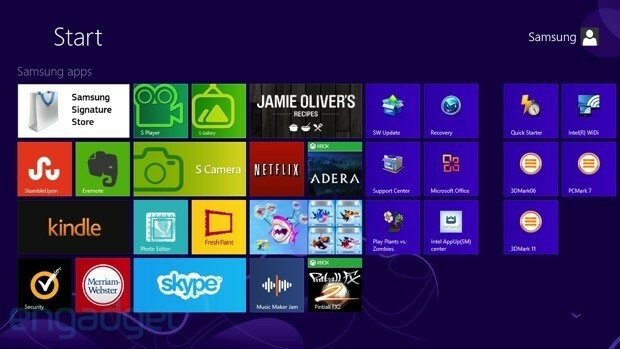 If nothing else, first-time Windows 8 users are going to get a solid introduction to touch. The good news about the UltraTouch's speakers is that they do get quite loud. The bad news: certain kinds of music, particularly bass-heavy tracks, can sound rather harsh at top volume. Even at more moderate settings the quality is still somewhat tinny, though it's no worse than what you'll get from most laptops, especially in the middle tier. 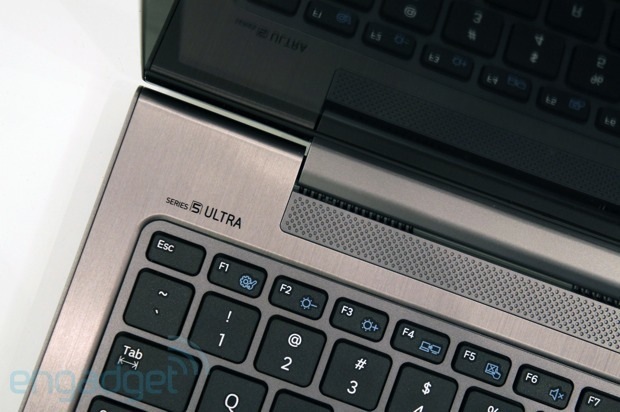 Similar to many of the Ultrabooks we test, the UltraTouch chugs along on a 1.7GHz Core i5-3317U CPU, Intel HD 4000 graphics and 4GB of RAM, though instead of all-flash storage it has a 500GB (5,400RPM) hard drive paired with a 24GB SSD for caching. And while some ExpressCache can never fully take the place of a proper solid-state drive, it definitely helps boost performance. For instance, booting into the Start screen takes 14 seconds, which is just two seconds slower than on the $1,200 Dell XPS 12. The included four-cell battery is rated for up to 5.2 hours, which is right on the money, if our test results are any indication. In our usual battery rundown (movie looping, WiFi on, display brightness fixed at 65 percent), the system lasted five hours and 23 minutes. That's not great, especially considering a not-too-skinny machine like this probably has room for a bigger battery. Still, it's right in line with other touchscreen systems we've tested, almost all of which crap out by the five-and-a-half-hour mark, if that. So, it's at least nice to know that this $850 system lasts just as long as machines that cost three or four hundred more. When it comes to bundling crapware on PCs, we're really not sure who the worst offender is, but there's no question Samsung is part of the problem. The Series 5 UltraTouch comes pre-loaded with an impressive number of apps, including StumbleUpon, Evernote, Kindle, Skype, the Merriam-Webster dictionary, Netflix, Jamie Oliver's Recipes, Music Maker Jam and Fresh Paint (a bit odd to see on a machine without pen input). There's also a trial of Norton Internet Security, along with various Samsung apps: S Player, S Gallery, S Camera, Photo Editor, SW Update, Recovery, Support Center and Samsung Signature Store. Speaking of stores, there's one from Intel, too: the Intel AppUp marketplace, which you'll find on other ultraportables besides this. Like pretty much every other consumer laptop we test, the Series 5 UltraTouch comes with a one-year warranty. In the US, at least, there are currently two configurations of the Series 5 UltraTouch: an $800 model with a Core i3 processor, and an $850 one with a Core i5 CPU. Either way, it comes with a 500GB hard drive and 24GB SSD, along with four gigs of RAM and a 1,366 x 768 display. If you're so inclined to go with this over competing models (and boy, are there a lot to choose from), your decision ultimately comes down to whether you need the extra horsepower, and whether you think it's worth it for $50. Samsung also tells us the i3 version is rated for the same 5.2 hours of battery life, so it's not like you'll enjoy a longer runtime by stepping down to a weaker processor. It's also worth mentioning that Samsung is coming out with some additional touchscreen Series 5 models, which will add backlit keyboards and have similar specs (hybrid hard drives, 1,366 x 768 resolution, etc.). Given their tray-loading optical drives, though, they could be unnecessarily thick and heavy, depending on your needs. Also, though Samsung initially told us the models would ship in February, when we spoke to a company spokesperson this week she wasn't able to give us an on-sale date or a confirmed starting price. Our biggest reservation is that it's slightly pricier than other machines with the same specs -- in fact, there are even a couple better-specced models that cost less. Starting with HP, there's the Envy TouchSmart 4, a 14-inch machine that starts at $750 with a Core i3-3227U processor, 4GB of RAM and a 500GB hard drive with a 32GB SSD -- basically, similar specs as the Series 5, except for $50 less. If you choose to trick it out, you can configure it with a Core i5 processor and 8GB of RAM. It's also pretty light for what it is: at 3.98 pounds, it's barely heavier than the smaller Series 5. If you're an ASUS fan (and we know many of you are), you've probably already been researching the VivoBook S400, a 14-inch touchscreen laptop going for $700 here in the US. (There's also the S200, which has an 11.6-inch display, if you don't mind a little less screen real estate.) For the money, the 14-inch model comes with a Core i5-3317U processor, 4GB of RAM and a 500GB hard drive paired with a 24GB SSD, which is a steal compared to Samsung's pricing. At 3.97 pounds with no optical drive, it's right on par with similarly equipped machines, like that HP TouchSmart we just told you about. For those of you who'd rather have more storage space than accelerated boot-up times, there's the Toshiba Satellite P840T ($880 after instant savings), a 14-inch laptop with a 1TB (5,400RPM) HDD. Other specs include a Core i5-3317U processor and 8GB of RAM. It's got an optical drive, too, which we can't say of all the notebooks listed here. As you'd expect of a notebook that's slightly larger and also has a DVD burner, though, it's a good deal heavier than the one we have here: 4.3 pounds is the starting weight. So far, we've been mentioning machines we haven't reviewed, but there are some options that we have tested. The Acer Aspire M5 Touch, for instance, is more or less the same 14-inch M5 Ultrabook we tested last year only, you know, this one has a touchscreen. That's selling for $730 in the US, with a Core i5-3337U processor, 6GB of RAM and a 500GB hard drive paired with a 20GB SSD -- excellent specs when you consider Samsung's Core i5 model retails for $850! Another familiar face: the Sony VAIO T13. Yep, it's the same 13.3-inch Ultrabook we reviewed last year, except now you have the option of adding a touchscreen for an extra $100 (the starting price with the touch panel is $770, putting it on par with the Series 5). 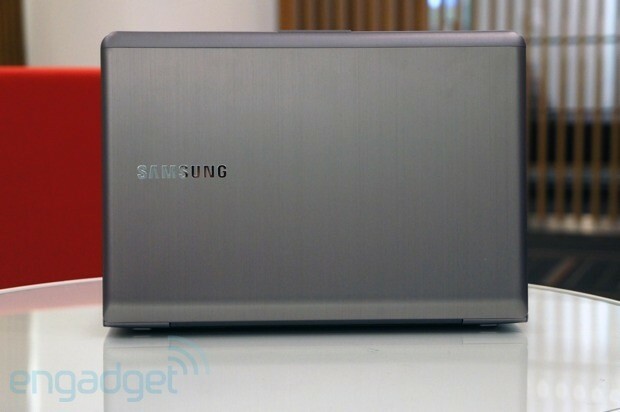 Like the Samsung Series 5 UltraTouch, it has no optical drive, except this guy weighs a bit less, at 3.77 pounds. Also similar to the competition, it starts with a Core i3 processor, 4GB of RAM, a hybrid storage solution (albeit with a piddly 320GB HDD) and a 1,366 x 768 display. If you like, though, you can configure yours with an i5 or i7 processor, up to 8GB of RAM and up to 512GB of SSD storage. As far as Dell goes, we struggled to find a mid-range touchscreen laptop that matches the Samsung Series 5 UltraTouch in both size and price. The closest thing appears to be the 15-inch Inspiron 15z Ultrabook, which starts at $700 after instant savings. At that price, it comes with a Core i3-3217U processor, 6GB of RAM and a 500GB HDD with a 32GB SSD. It has a DVD burner, too, which you'd typically expect from a notebook this big, yeah? In any case, if those base specs are too weak for you, you can get it with an i5 or i7 processor, 8GB of RAM and discrete NVIDIA GeForce GT 630M graphics with 2GB of memory. It'll be easier for us to name the best mid-range Ultrabook once we've tested a few more, but for now we can confidently say the Series 5 UltraTouch offers a comfortable typing experience, attractive design and battery life that isn't great, per se, but at least falls toward the upper range of what we've been seeing from other touchscreen systems. It's a solid option for people who want the Ultrabook experience (read: something relatively lightweight) but don't have $1,200 to burn on a new machine. Our biggest reservation is that it's slightly pricier than other systems with the same specs -- in fact, there are even a couple better-specced models that cost less. If you need those speeds and feeds to feel like you got the best deal, you'll probably cross-shop a few more machines before pulling the trigger, but if you're more concerned with sheer usability, the UltraTouch ticks off a lot of boxes.